Kavita Shukla’s FreshPaper wins in Copenhagen. WASHINGTON, DC: An idea that has its roots in her grandmother’s kitchen years ago on a trip to India, which led to her dabbling with experiments to preserve rotting strawberries in her middle school years, and then finally filing a patent at the age of 17, and founding her own company, has now germinated in Indian American Kavita Shukla winning one of the most coveted global awards in the field of innovation to address problems facing the world – the biennial INDEX award given in Copenhagen, Denmark, which carries with it the hefty prize money of Euros 500,000. Shukla, who has a Bachelor’s degree from Harvard, won the award for her innovative design FreshPaper, in the awards’ Home category. Her invention helps keep food fresh for two to four times longer, and is now sold at co-ops, independent stores, and national retailers in the US, including Whole Foods Market. It’s sold in 35 countries around the world. In accepting her award, Krishnan pointed out that 25 percent of the world’s fruit production goes waste every year, which is enough to feed the planet, and everyday 800 million people go hungry globally. Around 1.6 billion people have no access to refrigeration, and her invention is critical to poor people of the world. “FreshPaper is simple, low-tech and hyper affordable, with the potential to scale into new markets. The product has taken off in the United States, but it has immense potential to improve the lives of those living in less developed areas as well, where access to refrigerators is limited,” said INDEX jury chairman Mikal Hallstrup in a press release announcing the winners. FreshPaper is a square white sheet of paper the size of a napkin which when kept with perishable foods help preserve it, which Shukla displayed in accepting her award. The low-cost design is biodegradable and infused only with organic spices. Shukla spoke about how years ago when she had a glass of tap water in on a trip to India, became scared that she would fall sick. But her grandmother gave her a spices-mixed spice tea that she assured would ensure that she would not fall sick. Back in the US, Shukla became intrigued with what her grandmother had given her, and she started experimenting to see if different spices worked on fruits, especially with strawberries. She would dip the strawberries in different mixtures of spices to figure out combination inhibited the growth of bacteria and fungus best. She eventually was awarded the patent for FreshPaper at the age of 17, and went on to start a company called Fenugreen, in 2010. In the past, Krishnan has been recognized for her invention from many, including the Lemelson-MIT Foundation, the Cartier Women’s Initiative, the Davidson Institute, the Swiss Consulate, the French Ministry for Foreign Affairs, and Startup America. 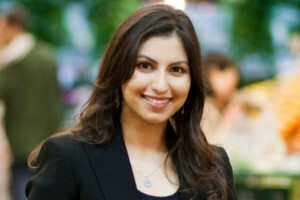 She has also been inducted into the National Gallery for America’s Young Inventors. She was also recognized as the founder of one of the most innovative young companies in the world as Grand Prize winner of the Kauffman Foundation’s Startup Open.